This week it’s Paula Watts who took part in the Malmesbury Carnival 10k with us last year. “In September 2015 our gorgeous daughter Heidi was diagnosed with Acute Lymphoblastic Leukaemia at the age of 2. She has undergone 9 months of intensive chemotherapy and is now in the maintenance stage of treatment which is the final stage of treatment. This will continue until Feb 2018 and although she still has chemo daily, this is administered orally so can be given at home. The only IV chemo she needs is on a monthly outpatient basis, so this stage should be much lighter touch from a hospital point of view. We are immensely proud of how well Heidi has coped with everything that has been thrown at her including numerous blood transfusions, lumbar punctures, general anaesthetics, heart echo, steroids and of course intense chemotherapy. Now that we can start to get some semblance of normality and routine in our lives my husband Ian and I are in a bid to get fitter and healthier and back in shape. 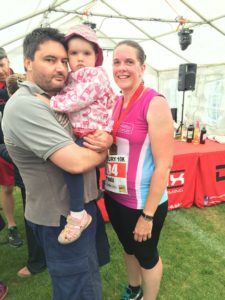 The aim is to do a series of fitness events/challenges over a 9 month period which included the DB Max Malmesbury 10K because that’s the length of time Heidi underwent intense chemo, and all the side effects that that entailed. In doing these we hope to raise money for four charities that have supported (and will continue to support us) through to Feb 2018.